San Diego based graphene producer Grolltex has signed an exclusive representation agreement with technology importer and sales representation firm Nakao International, to handle Grolltex’ growth in the strategically important Japanese electronics and technology sector. With this agreement, the Nakao group will help bring needed monolayer graphene materials capacity to Japan, which is a technology powerhouse but is currently underserved in the area of advanced 2D materials production and supply. Nakao International is a supplier and importer to Japan of key U.S. electronics and materials used in the defense, biotech and other high technology design areas. “We’re very excited to have Nakao International representing us and driving our key growth initiatives in the Japan market. The Nakao Group has shown powerful results over the years in penetrating key technology verticals in Japan and they have already produced some very strategic sales for us right out of the gate,” said Jeff Draa, Grolltex CEO. Grolltex, short for ‘graphene-rolling-technologies’, uses patented research and techniques initially developed at the University of California, San Diego, to produce high quality, single layer graphene and other 2D materials and products. Grolltex is even now nearing introduction of fully characterized, monolayer, hexagonal Boron Nitride (hBN), sometimes called ‘white graphene’, into the advanced materials marketplace. As an insulator, hBN is the isoelectronic (having the same electronic structure) complement to graphene as conductor. With both of these large area, high quality monolayer materials as offerings, Grolltex is bringing to market the single atom thick materials and tools that next generation device designers need. Grolltex, Inc., is a nanotechnology materials, products and equipment company focusing on the optimization and advancement of the key monolayer material ‘graphene’ and related 2D materials. 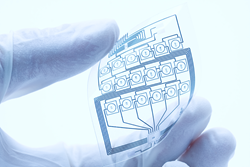 The company holds a number of strategic patents and technological advantages in areas relating to the manufacture of high quality, monolayer ‘CVD’ graphene as well as on several advanced products made of graphene and 2D materials, such as hyper efficient solar cells, next generation sensors, advanced fuel cells and futuristic super-thin and flexible displays for use in wearables, smart phones and other electronics. The company is a practitioner of, and specializes in, exclusively sustainable graphene production methods and is committed to advancing the field of graphene to improve the future of leading edge materials science and product design through the optimization of single atom thick materials.